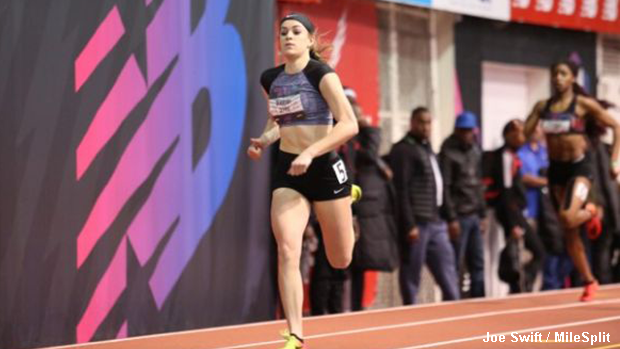 Abby Steiner closed her high school indoor track career in impressive fashion at NBN in New York City. The Dublin Coffman sprinter finished second in the 200m championship race with an Ohio record time of 23.51. This lowers her previous state best time of 23.60 from last month's SPIRE Showcase. Steiner's result represents a US No. 3 for the 2018 season. In addition to her strong 200m showing, Steiner placed fifth in the 60m championship final due to her 7.42 effort. The race was won by Tamari Davis of Gainesville, Florida in an incredible time of 7.25. Next up for Abby Steiner will be her senior season of outdoor track where she'll look to claim her third straight 100m state championship and her fourth consecutive 200m Ohio title.